Even though home theaters and surround systems are the best when it comes to gaming sound, headphones still offer better performance and restrict the sound to the gamer only. With the steady growth of the gaming industry, we now have specially designed headsets for gaming but as usual, the market is flooded with a lot of substandard products so it is quite hard to get the right headphone, especially for starters. 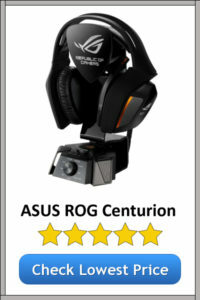 Asus ROG Centurion is a revolutionary wired gaming headset that delivers exceptional sound quality. What makes it leave a mark is the genuine 7.1 Ch surround system. It clearly separates different sounds giving users a clear distinction between different directional sound for them to take appropriate action. When playing combat games, you clearly hear where the enemy is and this helps you react first. Besides the excellent sound quality, it has a mic with noise isolation so you can be sure only your sound is picked and not any other background noise. It also comes with an ASUS exclusive Sonic Studio interface for balancing the sound depending on your equalizer preference. In terms of comfort, it is still impressive courtesy of full-size memory foam leather ear cushions. Even though it is s closed-back, its breathability is improved and won’t leave you sweating. The only problem is that it is wired so you will have to play somewhere near the console. I also think that it is quite bulky considering there is a headset and a control box. Also, the price is quite high but if you want a durable and high-performance gaming headset, these issues shouldn’t be a bother. SteelSeries Siberia 840 is another great gaming headphone that delivers exceptional sound just like the ASUS ROG. It boasts a powerful 7.1 Ch surround, perfect for combat games. I played FIFA using it and you can clearly hear the distinct player calls, fans chanting and the weight of the shot when it hits the crossbar. This is a wireless headset that uses 2.4GHz protocol for a lag-free sound and is also Bluetooth compatible. You can use it from a distance of 40ft and the battery lasted for around 16 hours even though the manufacturer puts it at 20. However, what makes it stand out from the crowd is its comfort and workmanship. First, at 318g, it is lighter than ROG which is about 450g. I had it on for around 4 hours nonstop and I couldn’t feel the pressure the ASUS ROG had mounted me for the same period. Also, the ear cups are more accommodating and very soft compared to most headsets out there. Besides, its aeration is improved so if you have hyperhidrosis, this will be a great purchase for you. Regarding build quality, it is more sturdy and ergonomic compared to your ordinary headphones and in fact, comes with a retractable mic. On the downside, it is still expensive but again, worth every buck. More so, it requires charging more often, even though the battery is long-lasting. If you are on a budget and you want the perfect blend of performance and affordability, LG G930 will be a great landing point. This headset comes with powerful 7.1 Ch surround system making it perfect for any sound intensive titles, especially AAA titles. There’s also a mic with noise cancellation so the gamer on the other end won’t have trouble getting what you’re saying even in a noisy ambiance. Remember, this is a wireless headset that works with the standard 2.4 GHz protocol and can be used from a 40ft range. 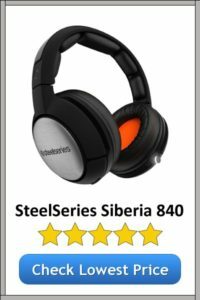 Even though it is not as comfortable as the Siberia 840, I like its build quality; solid and sturdy, likely to last you a few years before it starts wearing out. 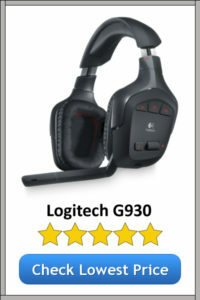 Retailing at around $80, this is among the best headsets you can get with 7.2 Ch surround from any top brand, the caliber of Logitech. In as much as you may find several cheaper options, remember buying from a trusted brand is a clever thing to do. Unfortunately, this headset’s battery can last for an average of 6 hours even though it is labeled as 10 hours. This is quite a short runtime considering the likes of SteelSeries can do a cool 16 hours. These are our best gaming headphones in the three categories; best in sound, comfort and lastly, affordability. If you love high-end gadgets, then check out for brands like V-MODA, Audio-Technica, Sennheiser, and Razer. On the other hand, if you are on a budget, there are numerous deals you can take advantage of including BENGOO G9000, VersionTech G2000, and Micolindun which in fact are bestsellers and cost under $30. If you are looking for amazing desks for your gaming setup then check out the site Supergamereviews. Before you go out for shopping or even pay for a headphone, make sure you know a thing or two about them. In this section, we have listed the important factors you need to consider when buying them. In the market, you will get in-ear gaming headsets as well as over-ear. The difference is pretty simple; in-ear headphones feature small earphones that you put inside your ear while over-ear have headbands with a speaker compartment on either end. In-ear headphones are easier to tag along but unfortunately, they may not be comfortable using them for long sessions. On the other hand, over-ear headphones are better in performance and more comfortable but quite bulky. Weigh between the benefits and the shortcomings of each and go for what you think will suit your needs and budget too considering over-ear headphones are generally more expensive. The debate on wired vs. wireless equipment has been around for quite some time and there are no signs of it going away soon. Both wired and wireless headphones have their advantages and disadvantages so it’s a matter of weighing the options. Wired headphones are by far the best when it comes to performance. Signal transfer is faster in wired connections as opposed to the wireless protocol. Also, there are no hassles of charging and replacing batteries, a common headache with wireless headphones. On the other hand, wireless headphones are now becoming popular bearing in mind controllers are now entirely wireless. What I like in wireless headphones is that together with a wireless controller, you can just sit anywhere in the room as long as you are in the wireless range. However, signal interference alters sound most of the times. All said and done, it is worthy to point out that many pro gamers tend to lean more on wireless headphones; better performance on console gaming and gives you the freedom to play form a distance of your preference, away from the screen. This is another important aspect that you should have a grasp of when buying a headphone for gaming. As you know, stereo systems reproduce sound as is at the time of recording with very minimal or even no processing at all. This makes it great for studios and those who like natural sound. On the other hand, surround headphones reproduce 3D sound just using the two speakers as in stereo. The difference, however, is the fact that stereo has only two directions of sound, surround replicates positional sound. The sound drivers are tweaked to create directional sound; you can hear whatever is behind you or what’s coming ahead of you. It goes without saying that if you are into gaming, a surround headphone is exactly what you should go for. In games like Call of Duty and Far Cry, you rely on it entirely to track the movement of your enemy. If you hear movement on the left, you quickly turn to the left side. Now that you have decided to go for over-ear headphones, the next hurdle will be deciding between closed and open-back design. Each headphone offers different performance and benefits. Besides, they all have shortcomings. It is important to understand all pros and cons of each. Closed headphones will isolate all the background noise leaving you with what you are supposed to hear only. These headphones are best for use in areas with background noise or when commuting because they don’t let out any sound. On the other hand, open back headphones deliver the best natural sound and are more comfortable because they have more breathability as air circulation is improved. Depending on whether you want a microphone or not, you have to decide between headphones and headsets. Remember, the key difference between the two is that headsets come with a mic while headphones don’t have one. I wouldn’t dictate what’s best for gaming because it entirely depends on the titles you play. If you love online gaming, then get a headset. With a headset, players can talk to each other in real time as opposed to typing that makes multiplayer gaming quite passive. On the other hand, if you don’t need the mic function, just go for headphones. I find the mouthpiece quite a bother even when detached! Gaming headsets are quite a fortune considering a good one will set you back around $100. Check for the build quality and choice of materials before purchasing any headphone. For over-ear, the headband should be strong and sturdy. Some years back, when I was green, I ended up with two dead headphones in a span of a month; one broke its headband and the other one, the cup material got tattered. A good way to check this if you are not in the physical store is to read verified reviews and see what people are saying about its durability. Once you have decided to go for a wired headphone, it’s time you weigh your options regarding connectivity. First, is the headphone wired permanently? And if yes, what’s the connection? Even though the common connection is a 3.5mm jack, please note that there are those that come with a single 3.5mm port while others come with two. With advanced headphones, you can also get an additional USB port. As a gamer, this should not worry you much as PlayStation, Xbox and PCs support all the above options. Make sure what you buy is comfortable enough to allow you play for long without hurting your ears or making them sweat. Here, there are three important aspects to consider; soft cups, breathability, and weight. Get a lightweight headphone that won’t be exerting too much pressure on your temple. Also, consider the material used to pad the cups. It should be soft and breathable to prevent excessive sweating, especially during summer. If you are the type that sweats a lot, I would emphasize the fact that open back headphones are the best because of improved air circulation. Besides the above aspects, you also need to factor in other issues like the brand and price. Buy a trusted brand and make sure the headphone you buy is worth the price. Do a little window shopping to know what features to expect at what budget. Above all, stick to your budget! A good gaming headphone is not just cool, it may help you make better gaming decisions especially in combat titles. However, there are many other factors that you need to consider in order to get value for money, So, if you are an avid gamer, get a good gaming headphone and create an immersive and almost virtual gaming ambience that replicates real-life situation as far as sound is concerned in order to complement the much-advanced graphics!